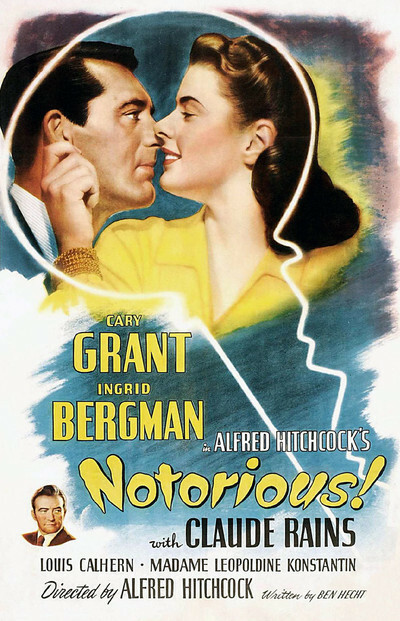 Tonight’s feature is Alfred Hitchcock’s 1946 film NOTORIOUS. It may not be a film noir but it’s got spies, Nazis, and it is a masterpiece. I absolutely love this film. It is glorious to look at and the actors: Ingrid Bergman, Cary Grant, and Claude Rains are at the top of their form. If you’ve never seen NOTORIOUS you are in for a treat. Even if, like me, you’ve seen it dozens of times it is still a great way to spend the evening. After her Nazi father is convicted of treason by a Miami, Florida jury, German-born Alicia Huberman tries to forget her pain by throwing a loud party and flirting with uninvited guest T. R. Devlin. Late that evening, an intoxicated Alicia takes Devlin on a drive and is stopped for speeding by a motorcycle officer. When Devlin flashes his official credentials, however, the officer allows Alicia to go without a ticket. Alicia, who has been hounded by reporters and police, is infuriated at Devlin and denounces him as a double-crossing “cop.” Although Devlin disapproves of Alicia’s self-destructive, promiscuous life style, he is confident of her patriotic feelings toward America, having heard secretly recorded comments she has made, and offers her a job infiltrating a Nazi industrial combine in Brazil. And so begins one hell of a tale. Enjoy! This entry was posted in 1940s, Film Noir Friday and tagged 1946, Alfred Hitchcock, Ben Hecht, Cary Grant, Claude Rains, Ingrid Bergman by Deranged. Bookmark the permalink.